Jan Lundberg likens the So. Central Farm to a new Eden. It sure doesn’t feel like an inner city and the food grown and cooked there tasted fabulous. 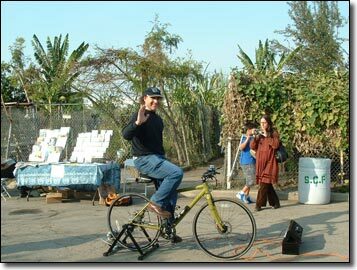 February 8, 2006 1200 PST (LOS ANGELES) – Amazingly, there is a thriving 14-acre farm in the middle of Los Angeles organized along the lines of a community food garden. Possibly the largest urban farm in the U.S., it’s a highly productive operation run by 350 families who work this inner-city land. They would otherwise be malnourished, in the sense that they would be – like almost all of their fellow citizens of this fast-food nation – forced to rely on costly corporate foods tainted with petrochemicals and shipped from far away. The daunting problem of healthy eating is more difficult if you are poor or have immigrated into a culture that is not particularly welcoming. The South Central Community Farm is a thirteen-year-old experiment. While Peak Oil is making its successes into crucial object lessons for urban survival, it wasn’t begun with Peak Oil in mind. In fact, the reality of Peak is just now penetrating the consciousness of these urban farmers, whose experiences are of inestimable value for the rest of America. When the inevitable time comes for other inner cities to learn how to produce food organically for local consumption, these experiments and their results will be the basis of our chances. The rare example of healthy land-use that is the South Central Community Farm is threatened by the crony capitalism of insensitive, unaccountable government authorities who give precedence to industry and profits rather than to people. The officials involved apparently have little or no awareness of Peak Oil and what it means for food supplies. 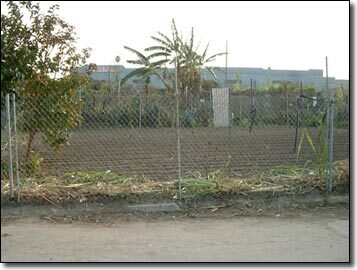 The City of Los Angeles has allowed a developer, Ralph Horowitz, to buy the land for a song for the purpose of building a warehouse. Horowitz is trying to evict the people and seems intent on destroying the Farm. With industrial warehouses and factories all around the inner city farm stands out. The owner wants the land to build a warehouse for Wal-Mart. There is new impetus for profitable development under a petroleum-based paradigm in this long-depressed area of Los Angeles. A new truck / rail-freight connection to nearby ports has appeared in an area adjacent to the Farm site. Most of the products moving through the ports would involve Walmart. The real estate deal smells bad, especially since decisions were made without community input. Eviction has just been ratified by a local court, and although the legal fight continues, forced removal of the farmers now appears to be imminent unless it’s prevented by an upsurge of support from citizens willing to stand with them. Nonviolent civil disobedience is called for and planned, because waiting for the next city election would mean the total loss of an invaluable community and ecological resource. South Central Los Angeles has been one of the most impoverished and violent inner cities anywhere on the planet in history. If this “experiment” is nurtured, protected and defended, locals will continue to grow their own healthy food, to trade among themselves, to exchange crops, and to enjoy livelihoods that involve their children in safe activities. From huge signs facing the roads around the Farm, it is clear the farmers are disgusted at the mayor of the City of Los Angeles and others for having given lip service to the Farm and yet opened the door for the possible imminent eviction and destruction of this new Eden. While the farm and its surrounding area are multi-ethnic, the farmers and their leaders are by and large Mexican and Guatemalan. Recent immigrants to South Central L.A. and much of California come from Latin and Central American villages that grow their own corn, beans, squash, avocados, and edible cactus, the same crops that predominate at the South Central Community Farm (while those are the staples, the farm grows over 150 species of plants, including many medicinal herbs). Unlike the average North American, these farmers and gardeners still have a connection to the land. It’s mediated by a culturally determined communitarian ethos that makes for a strong political organization, and by a historical sense of perpetual struggle over land use. This is the case on both sides of the border, from the Sunbelt down to Cape Horn. Most intriguing to those following Peak Oil, as we search out ways to mitigate the coming collapse of the agriculture/distribution infrastructure and financial system, the South Central Community Farm is actual local food production needed for the time when trucks stop rolling into supermarkets. 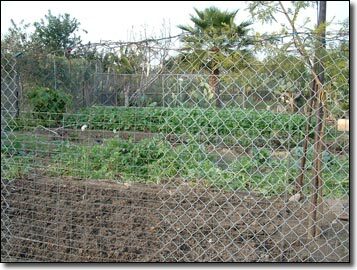 The absence of many food gardens and farms in U.S. cities, and the lack of access to any land at all for poor people who can provide for themselves if given a chance, makes for an object lesson: in this nation of maximum car dependence and the “10,000 mile Caesar salad,” most Americans would rather let their State wage unconscionable oil wars than grow their own food. 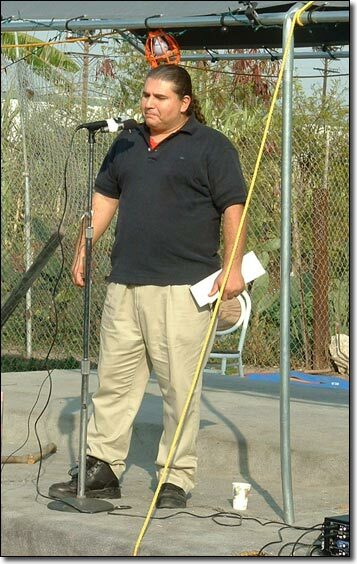 I learned of the South Central Community Farm only because I was visiting the Los Angeles area to give several lectures on petrocollapse. The Farm was included for an event where speakers like me would discuss food security. The alternative press has given good attention to the Farm, but the low numbers of visiting supporters is of great concern, particularly when a judge ruled on January 30, 2006 that Horowitz can evict and tear out the food plots. Horowitz had a claim to buy the land on the basis of right of first refusal, having once owned the parcel in the 1990s, but the City could have legally refrained from following through. Egregiously, the City let Horowitz buy it back, this time for $8 million less than its prior selling price some years ago when values were much less than today’s. As an oil industry market analyst, I take the position that Peak Oil as a geological phenomenon works as a trigger for the sensitive oil market to react strongly (to put it mildly). When supply tightness hits the breaking point --current conditions are close to it – greatly aggravated shortages and hoarding will bring down the global economy. I call this petrocollapse. Obviously, having a local food supply is crucial, although thousands more farms would be needed for Los Angeles. These developments were demonstrated and overcome in Cuba, where thousands of small farms now supply Havana’s 2.2 million people with over half their food. Cuba went through its petrocollapse, after Soviet oil suddenly dried up from 1989 onward. As FTW described more than two years ago, by whatever name you call it, Cuba’s adaptation to energy shortages was a new form of local capitalism more akin to that advocated by Catherine Austin Fitts than to the current model which transfers wealth, control and equity to faraway places. For the U.S., which has much less of a community structure for political participation than does Cuba, the huge, corporate systems for providing food and fuel have left almost everyone extremely vulnerable. The dire price will come all too soon, because the global peak of oil extraction is probably upon us today. When just-in-time delivery of modern commerce is suddenly paralyzed, and when people cannot get to their jobs, and when goods and services become unavailable, America is going to be like a coast-to-coast post-hurricane New Orleans. The rest of the industrialized world will be in similar shape, but not brought quite so low as will be the most wasteful nation on the planet. Even if one can wish for a kinder post-Katrina federal response, it is indisputable that economic growth cannot continue when cheap energy disappears. Alternative energies are not feasible, or, in the instances that they are, they cannot be put in place on a large enough scale. So Los Angeles, the U.S., and the rest of the petroleum-dependent world will be unprepared for petrocollapse. When economic growth stops and rapid contraction begins, say goodbye to the supermarket and say hello to neighborhood food gardens. In early 2005 the U.S. Department of Energy released a study of Peak Oil and its implications. Directed by Robert Hirsch of SAIC (Science Applications International Corporation, a Fortune 500 company), the study stated that Peak Oil can only be dealt with by long term planning twenty years before the Hubbert Peak. But, stressed the study, if the nation waits for that peak to begin countermeasures, the result will be failure with “severe economic hardship.” There will be no technofix to perpetuate the status quo socioeconomic system, a fact which harkens back to The Last Poets’ famous poem “The Revolution Will Not Be Televised.” Some analysts, including this writer, anticipate a die-off, but few admit to it publicly. Making the rounds at the highest echelons of power is the concept of “demand destruction.” My belief is that the entire system will suddenly, or in several sharp jolts, without warning, fail to provide for modern societies’ extreme overpopulation when energy becomes too expensive and terribly scarce. There are 10 calories of hydrocarbon energy input for almost every calorie of food (before cooking) in the current system. Any major disruption to today’s already taut petroleum system will immediately cause chain reactions in all sectors, resulting in a crash that will perhaps bring the curtain down on modern civilization. Although the South Central Community Farm may be lost, the need to provide for food locally and organically will not go away. Whatever lessons have been learned there are invaluable. The basic human impulse to use nature sensibly for food supply in a sustainable fashion is not only our long prehistory, it is our future. After petrocollapse and the loss of many lives there may be a universal attempt to break with the discredited past. A radical change in culture may avoid the fundamental mistakes that led to massive pollution, resource wars and climate change. If we don’t get it right, and soon, the entire planet’s biosphere will be (and possibly already is) permanently damaged beyond recovery on any human time scale. The South Central Community Farm is but one oasis in a desert of polluted urban blight and La-La-Land enclaves and suburbs of false wealth. At the Farm it is the excellence of the harvest and the pride in the food, as well as the convivial, festive vending of locally grown produce, that rewards the people — in contrast to the “successful,” isolated, and affluent consumers who don’t know their own neighbors. The cooperative and peaceful sharing of land without giving one’s labor and time to a corporate slave master is a daring experiment in a state that used genocide of the original benign holders and stewards of the land to create what is now called California. 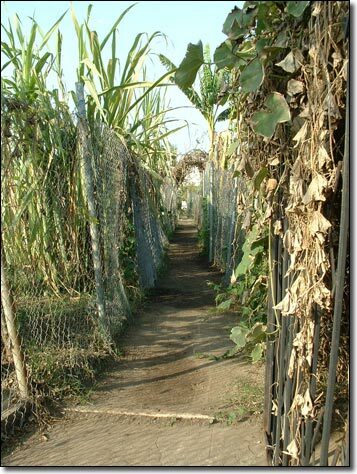 The Cuban experience was that urban food gardens and farms had to be fenced and padlocked to prevent the widespread theft that might have triggered a breakdown of the tenuous reorganization of agriculture. But after a few years of successfully raising productivity with organic methods and restoring the soil — instead of mistreating it — the locking up of the gardens and farms became unnecessary and remains so today. One need not go to Cuba to understand the significance of the South Central Community Farm, but we should keep Cuba’s track record in mind instead of mindlessly going to our supermarkets and corporate chain “restaurants.” Cuba also had to promote the bicycle and the transit bus because of the island’s petrocollapse. Are we so much better off with our SUVs and our fruit from Chile and New Zealand? Another worthy model is our own nation’s experience with Victory Gardens. Depaving and tearing up lawns supplied much food during World War II, helping to galvanize this country for the war effort. As in the Cuban case, it has been said that the people led the way with their Victory Gardens and the government reluctantly ended up embracing it. The U.S. government did have enough leadership and sense to adopt rationing of gasoline and other products, recycling, scrap collection, and even hemp cultivation, measures which found their places during WWII. But the opposite ethic holds sway today, as the most corrupt and backward administration imaginable for our critical times goes instead in the direction of environmental destruction and overdependence on petroleum. Meanwhile, land continues to be paved over that once grew food or served as wildlife habitat. The idea of growing fuels instead of food, for instance by growing corn for ethanol, is a nonstarter partly because the abundant energy required to produce ethanol makes this “solution to our oil addiction” prohibitive. Yet in his recent State of The Union Address, Bush continued to advocate what amount to subsidies and handouts to agro-biz corporations like Archer Daniels Midland that actually threaten to reduce food supply in this country. END OF THE STORY, OR A NEW BEGINNING? Over a decade ago, when the L.A. Regional Food Bank was able to encourage and support the creation of the nearby South Central Community Farm, no one knew that the project would last more than a few years. But today the Food Bank has become an opponent of the farmers in the legal dispute, and allies of the Farm are still too few and far between. After thirteen years, so many people who depend on the farm must not be displaced. Nor should nature be dealt another body blow in the disgrace known as Los Angelization: toxic sprawl and endless growth. 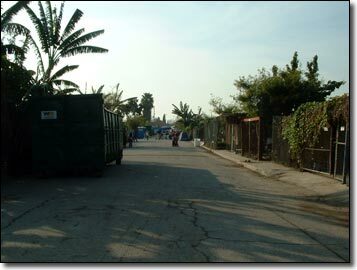 The population of Los Angeles does not seem to realize that all people everywhere are threatened by (1) the disgraceful deal being carried out in the name of private property and by (2) the very system that conjures such relationships between residents and institutions like “The City,” a government that supposedly represents the people. I encouraged a USC film crew that interviewed Michael Ruppert and me at the Farm on January 29 to spread the word and immediately get involved in the Farm and try to save it. Now that would be a worthwhile educational experience that would also save lives. The farm’s eloquent spokesman Tezozomoc displays serious political savvy and a thorough knowledge of energy-related issues. According to several people interviewed most of the farmers have little or no awareness of Peak Oil. The address of the farm is 41st and Long Beach Avenue, near the Vernon stop on the Blue Line Metro rail system. Contact the South Central Community Farm and offer any help and encouragement you can, by going to the Farm’s website or email. See the City Beat/Valley Beat newspaper’s cover story in its Jan. 26-Feb. 1 edition. The Los Angeles Post Carbon group’s leader Eric Einem has a story about the Farm on Indymedia. The Earth First! Journal did a story on the farm in its January-February 2006 issue, not online. Read the Petrocollapse and Food Security (Farm event Jan. 29) webpage of the South Central Community Farm. See the film “The Power of Community: How Cuba Survived Peak Oil” by Community Solution, Inc. – Order the documentary DVD here. A story on the farm and on my talk by Jennifer Murphy is at Indymedia: http://la.indymedia.org/news/2006/02/146380.php. Jan Lundberg is a former analyst for the petroleum industry, utilities and government agencies. His second career from 1988 onward has been as an environmental activist attempting to turn back petroleum industry expansion. Lundberg has published the Auto-Free Times magazine, run the Alliance for a Paving Moratorium, and established and managed Pedal Power Produce. In 2001 he and his crew at Sustainable Energy Institute rolled all the organization’s projects into Culture Change. Jan is based in Berkeley, California, where he works on campaigns against the plastic plague (to enact fees on shopping bags, for example). Jan travels the county via Amtrak to speak on petrocollapse and a hoped-for sustainable culture of the future. For more information on Jan’s work, see http://www.culturechange.org and http://www.petrocollapse.org. He can be reached at [email protected] or tel. 1-215-243-3144.